Felara Andrethi is a Dunmer healer who sells ingredients, potions, and spells in Tel Aruhn's Tower Living Quarters. She will sell to non-Telvanni members, but as usual gives discounts to those in the faction. 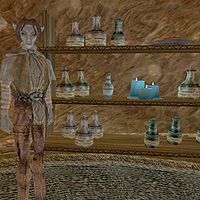 Felara is a restocking vendor for the following ingredients: Chokeweed, Comberry, Marshmerrow, Rat Meat, Saltrice, Scamp Skin, Scuttle and Small Kwama Egg. She wears a common shirt with matching pants, shoes, and belt.